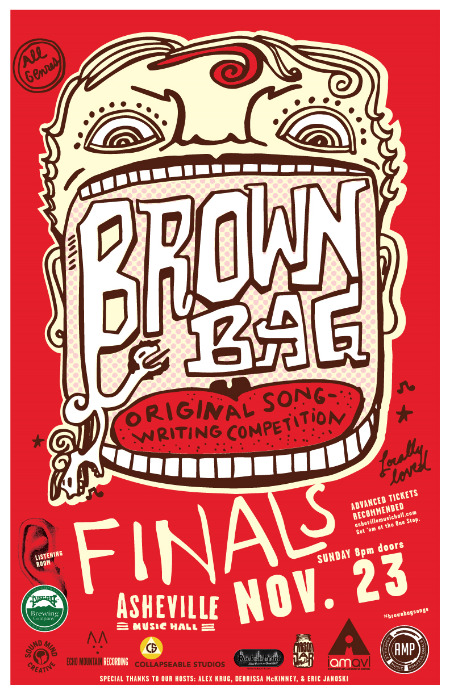 November 7, 2014 (Asheville, NC) -- The 8th season of Asheville’s Brown Bag Songwriting Competition is coming to a close this month after 11-weeks of stiff competition from some of Western North Carolina’s best singer-songwriters. The event will be hosted at Asheville Music Hall on Sunday, November 23rd and will feature winners from each of the 2014 Brown Bag series semi-finals. Performers will be competing for a $500 cash prize plus studio time in Echo Mountain and Collapseable Studios. Tickets are on sale now for $10 and available at the venue box office as well as online from Brown Paper Tickets at http://www.brownpapertickets.com/event/900522. A networking event for musicians and music professional will take place prior to the finals starting at 6 pm.